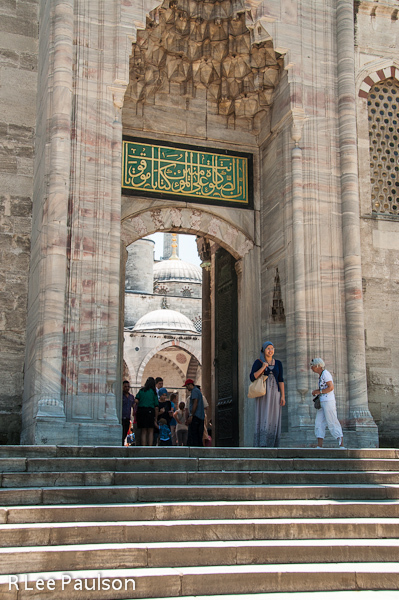 Women were asked to cover their heads and shoulders before entering. It is considered proper etiquette for the faithful, especially the men, to wash hands feet and head before entering a mosque for prayer. 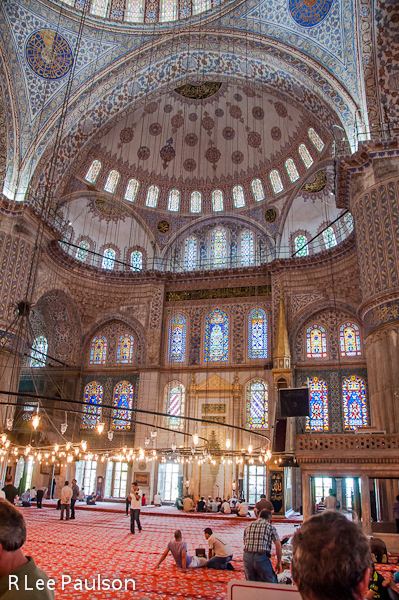 The Blue Mosque got its name from the thousands of blue tiles that line the main dome and columns. Looking up at the main dome. Tourists were allowed to enter, however, it was requested that we stay behind a rope near one of the outer walls. This was one place where I wished I had a wider angle lens. Four smaller domes surrounded the main dome. 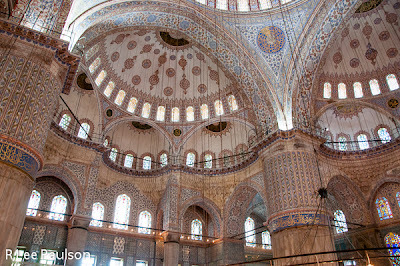 Smaller domes surrounded each of those. 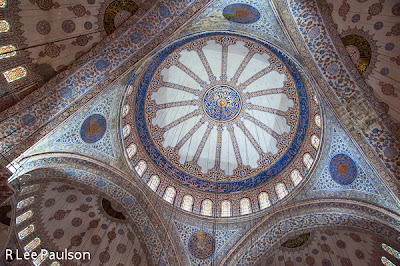 A close up of the intricate dome designs. 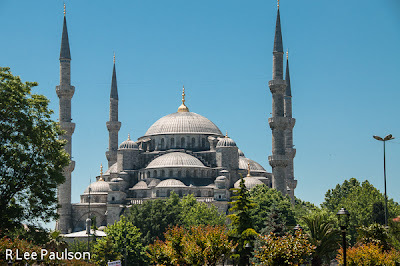 Outside, again, the Blue Mosque has six minarets like the one above. 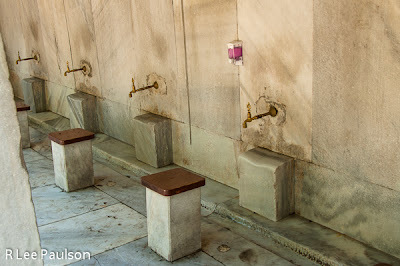 Only the mosque in Mecca has more. Most of the smaller mosques we saw only had one minaret, and most of those only had a single balcony, instead of the three shown here. 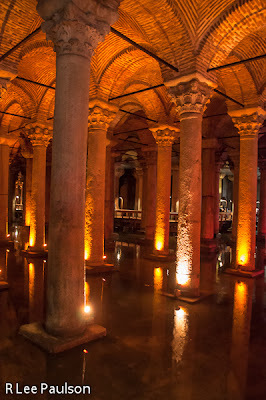 Around the corner from the Blue Mosque, we entered the Basilica Cistern. Built by Roman emperor Justinian in 532, this underground cistern was built using 336 columns arranged in 12 rows as support. It measures 213 x 469 feet, and at one time held over 21 million gallons of water, which was collected from 12 miles of aqueducts. This is a perfect example of how the Romans, like previous empires before them, reused architectural materials from previous buildings. 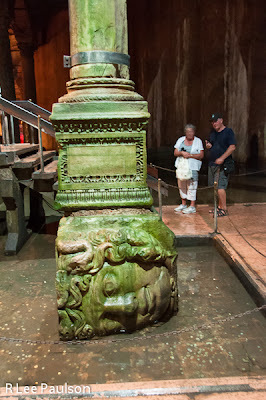 Here, the head of Medusa serves as a support for one of the columns. 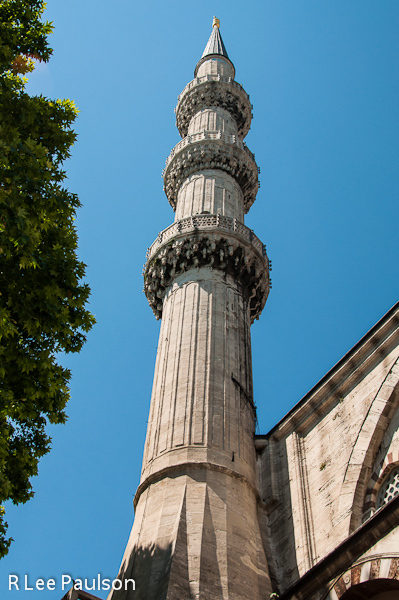 Outside in the square near the Topkapi Palace and Blue Mosque on the site of the old Hippodrome (horse racing stadium), stands the Obelisk of Theodosius. The obelisk was brought here from the Amon-Re temple at Karnak in AD 390. If one looks closely, one can see they didn't get all of it. The monument was cut down for transit. 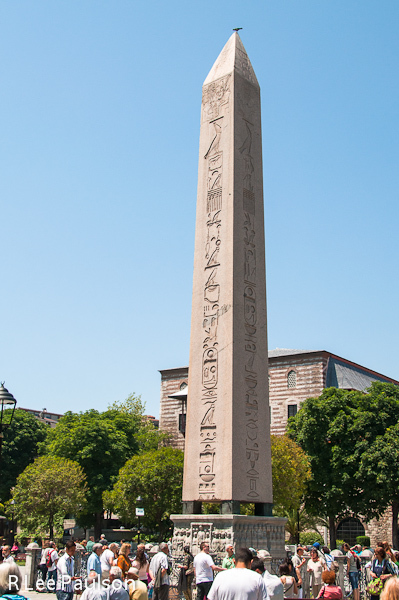 As a side note, I find it interesting that the ancient Egyptians who made the monument in 1549 BCE or so, had no trouble transporting the much longer original over a hundred miles down the Nile from Aswan to what is now Luxor. This is what's left of a Spiral Column that was once part of golden basin supported by three serpents. 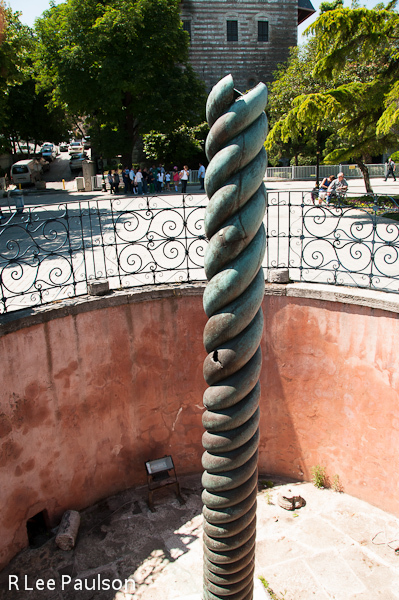 This originally stood over the temple of Apollo at Delphi. 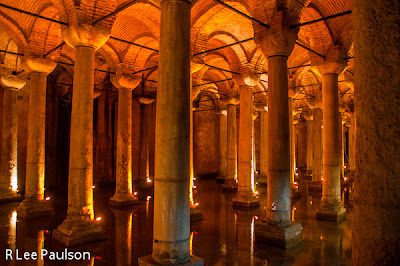 It was brought to what is now Istanbul in AD 330 and has not been moved. Notice how much higher the level of the surrounding square is now, compared to when the column was originally installed. 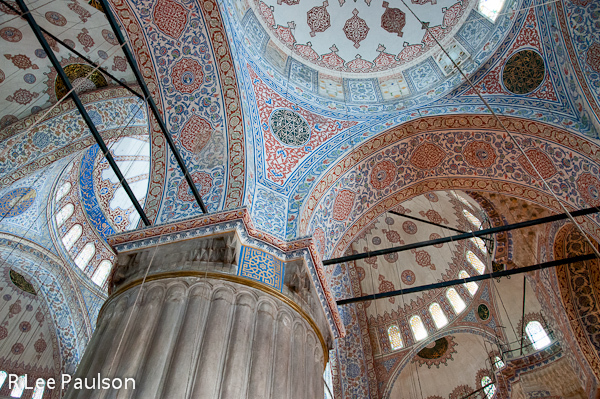 Continue on to Post 4: Istanbul - Hagia Sofya, by clicking here.